This plant litter box review shows that it is also found under the name Good Pet Stuff Hidden liter box. 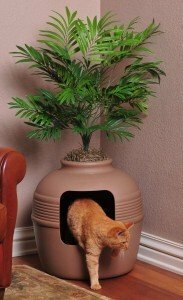 This plant litter box looks like a nice clay pot, but is made of durable polypropylene a sturdy and good quality plastic. It has a large capacity and therefore is good to use for bigger cats also. The plant litter box is about 42″ high including the plant on top. The total measurements are 19″ x 19″ x 14″. Weighs 6.3 lbs. Meaning that the diameter is 19″ and although it says 14″ high I read that someone mentioned it was actually 20″ high without the plant. Pros mention a lot of great things and here are the ones we found most relevant. This plant litter box is big. The cat love it and it looks nice in the house. Most visitors do not realize it is a litter box. Seems to be hard to use litter box liners since they can not be tucked inside. Some people did not like the plant and replace it with some other plant. To place the top on the bottom part is sometimes hard and some buyers mentioned that it warps over time and does not fit anymore or just after fiddling with it over and over to get it to close right. This was basically the only cons we found in all the research we did. With an average rating of 4.6 out of 748 ratings we could just assume that this plant litter box is a great product, but as always we like to have a look the lower ratings. Most lower ratings complain about how hard it is to fit the top part to the bottom. It is hard to line up and you sometimes have to try several times. We even read that there was one buyer receiving 2 different sizes. This all means that we advice to open the box and check if the top and bottom line up and are easy to assemble. When you clean out your litter box it can be very annoying to deal with this every time. For the rest we could not find to much wrong with the plant litter box. The imitation plant on top is not too pretty according some buyers, but that is a personal choice and you can buy an other one or even leave it off total. Overall we think this hidden litter box is a good buy. Be careful on Amazon. There are 2 stores that sell this product and as far as I can tell it is the same plant litter box. The link on our page will take you to the cheaper version and is called the Good Pet Stuff Hidden Litter box. There were people who mentioned that they have this litter box for 4 and the other for 5 years and they still use them. Read all ourElegant litter box reviews here.